«My Princess» ended as second ACE bird in the Team Femhøje Yearling Championship 2017. 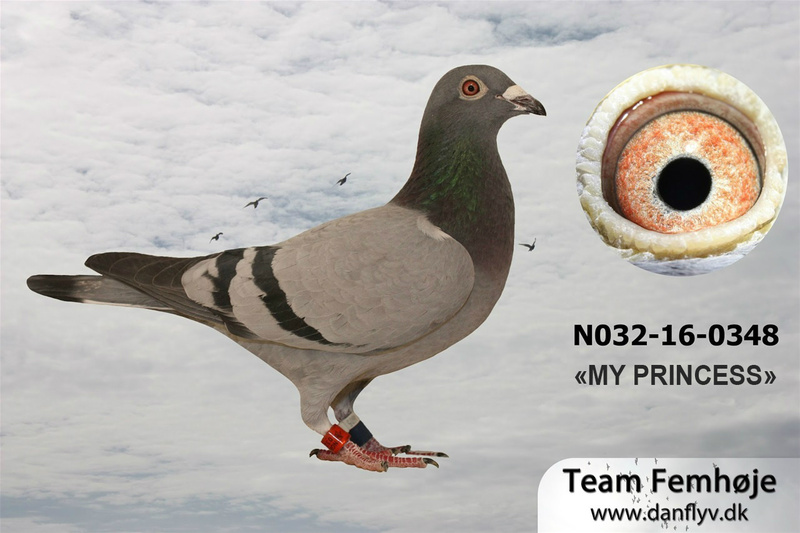 «My Princess» raced 20e in the young bird final at Team Femhøje 2016 and is a nice hen with van Koopen / Twan Bongers bloodlines. FATHER (ref. PAIR 11/2017) is direct from Koos van Koopen and a full brother “4008” won 3e young bird WHZB, “8008” won 1e Quievrain, “8007” won 1e Sens. Father is a grandson «Son Blauwe Vierzon» (raced 1e / 1.236b – Ablis, 2e / 1.170 – Ablis) x «Wondergirl» who is full sister of father of 1 NPO winner Blois young bird ’09 (Versteeg Cor). FULL SISTER (NOR-032-16-484) raced in Norway 2rd prize at Drevsjø (450km).